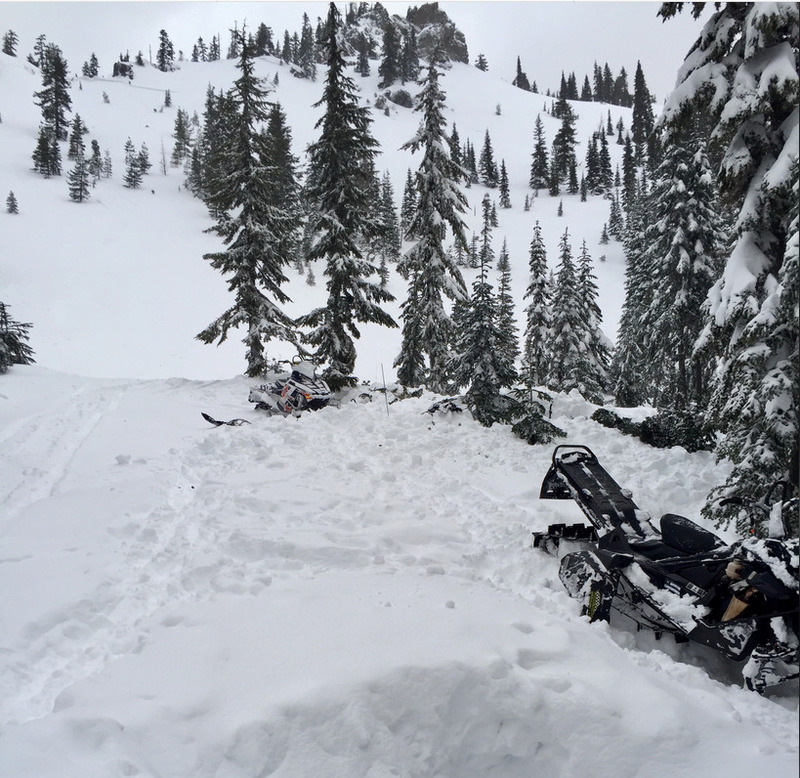 I'm starting this thread to collect information and thoughts about the snowmobile avalanche accident that occurred on Sunday, Feb 25, 2018 near Mirror Lake, south of Snoqualmie Pass. I also want to acknowledge that there are reports of two teenagers missing after a Sunday snowshoeing trip near Alpental. A search is underway for them. I'm hoping for the best in that search, but won't comment further here. For this thread, I'm going to focus on the Mirror Lake snowmobiling incident. The main reason I want to discuss this is because the Mirror Lake accident occurred close to the route of the Mountaineers Patrol Race, which took place on Saturday, Feb 24, one day before the snowmobile avalanche. My team raced in the Patrol Race, and other friends were either in the race or took part as organizers. When the decision was made to go forward with Saturday's race, a few teams decided not to run, but most did run (including mine). The Patrol Race organizers notified all teams that if they decided to stop to dig a pit or otherwise evaluate snow conditions more carefully during the race, they would be allowed to deduct any time spent for this from their race time, by taking digital photos of their group at the start and end of their safety evaluations. Photo timestamps would be used to deduct this time from their race time. I'm not aware that any teams decided to do this during the race. At least two snowmobiles can be seen in the photo. Reports indicate that the snowmobile party included five people. Two were caught in the avalanche and one of those was rescued alive. Near the upper-left corner of the photograph, there appears to be a fracture line visible just below the ridgeline. I don't know for sure if that fracture is associated with the fatal avalanche. I've skied the Snoqualmie-to-Stampede Pass Patrol Race route through the Mirror Lake area at least 10 times since 2001. I've raced in every Patrol Race since the event was revived in 2014. I'd like to apply that experience to help think about the Patrol Race and our decision-making going forward. Looking at the photograph above, I'm confident that the site pictured is not actually on the Patrol Race route. 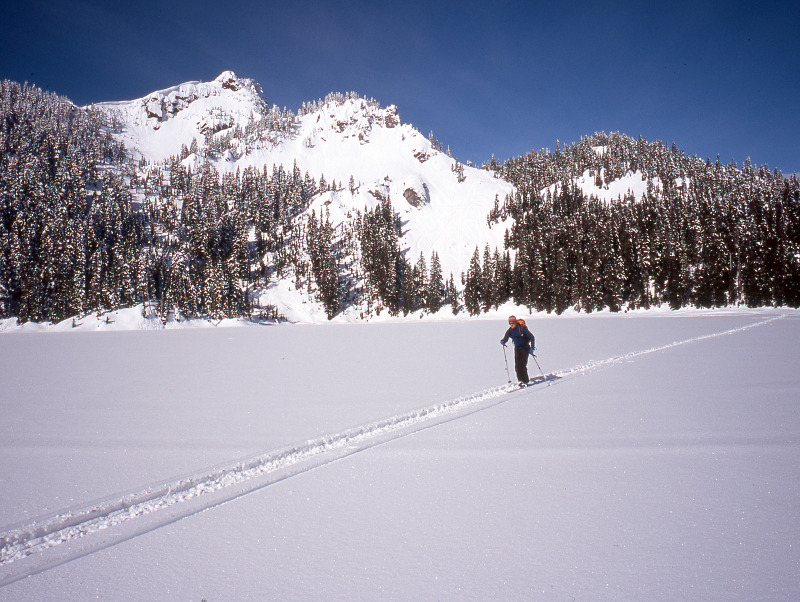 The following photo shows John Mauro crossing Mirror Lake on the Patrol Race route in 2004. The above-treeline terrain in this photo does not match the scene of the Feb 25 avalanche, and the normal ski route doesn't go anywhere near that terrain. While media reports have said that the fatal avalanche occurred near Mirror Lake, I don't think the KOMO-TV photo shows the Mirror Lake basin. My guess is that this may be in or near the Cottonwood Lake basin, which is about 1/2 mile ENE of Mirror Lake and about 300ft lower. It would be good to have more clarity on the location. The Patrol Race route never crosses terrain as open as that shown in the KOMO-TV photo. It does cross a few, much smaller open slopes, but none as large as what the photo shows. In the vicinity of Tinkham Pass and Mirror Lake (above its outlet) the Patrol Race route travels through old-growth forest. The photo of the Feb 25 avalanche location shows terrain that is considerably more open and alpine than where the Patrol Race route travels. Media reports indicate that the Feb 25 avalanche occurred while the snowmobile party was eating lunch at the base of the avalanche slope. It's not known whether they had ridden the slope that avalanched. I'm posting this information to provide a foundation for discussing future planning for the Patrol Race. At this time, I don't have any criticism of the decision to hold the race, and I don't recall any serious misgivings about the conditions I observed while we were skiing the route on Feb 24. I welcome your thoughts and observations. There was a lot more snow and increased wind-loading Sat night into Sunday. Sunday's avy threat(note this is based purely on weather data and I was not out there to dig pits) looked much worse than Saturday, especially on downwind(easterly) aspects. Saturday I could see cautious playing in the hills... Sunday was a big red flag. I think you might be right about it being in the cottonwood lake basin. I recognize that ridge as the one that holds the twin lakes couloir. I remember topping out after booting up it and looking down on that basin and seeing a couple groups of sleds in there on a past trip. My condolences to friends and family. Thanks for starting this discussion. I skied the Patrol Race last year. As a newer backcountry user, my threat filter is certainly set at a lower threshold. I remember thinking through about 6 potential avy areas of concern depending on the wind loading direction and my team felt comfortable passing through them in the conditions last year. I marked them out in this Caltopo map. It looked to me like most of them would require a natural release or a (very) remote trigger. I was most concerned about the path I marked "SE Silver Peak slide path" since the start zone is high above in the alpine zone which we wouldn't be able to evaluate from deep in the forest. I don't know if it slides very often, but if it did it'd be really bad luck for those below. The satellite view shows the snapped trees extending far below the race route. There are a couple other less-recent and narrower paths further north on the E flank of Silver Peak as well. If the winds were out of the east/NE, I thought there might be a couple potential trouble spots on the Summit West/Central ridge. The powerline clearcut extends far above the race route to the ridgetop where windloading could happen much more readily. On the west aspect the PCT winds its way through some locally steep and awkward areas - I'm sure those could locally slide given the right conditions even though it is mostly forested. If you took a ride there it could be awkward to travel below the trail for a rescue. I can confirm from SAR contacts that the slide was on the S-facing slope above and between the 2 Cottonwood Lakes. I cannot confirm any other details beyond what the news reported (I can't confirm the accuracy of that, either, since it was variously reported "at Crystal Springs Sno Park" and "on Stampede Pass"). As one of the patrollers on the race (I did checkpoint 1 to the finish) I can also assure you we are evaluating the process from our end. I hope I or one of my fellow patrollers will be able to fill in some insight into the decision-making process. 1 - We did see a natural avalanche, albeit small, not far before Tinkham Pass? (NE of Tinkham Peak). There was a 50' wide slide with a 10-12" crown on a convexity 75-100' feet above the skintrack. The slide did not come down to the track as it was stopped by a stand of mature and old growth trees. We saw evidence of two or three other slides away from the track during our sweep. 2 - By the time we came through, the skintrack across Mirror Lake was obliterated by snow machine tracks. There were also multiple ascent and two descent snow machine tracks high on the right side of the open slope just above John Mauro's head in the picture you attached. The slope angle and limited anchor points were optimal for a slide. 3 - For those who stayed on course, the Patrol Race track descended the mature stand of trees at 2:00 behind John in your picture. One party did descend into the Cottonwood Lake drainage instead of to Mirror. They ended up climbing out and then descended to Mirror on the main trail. I have also been thinking about the rapidly changing avalanche and weather conditions that occurred over the weekend. When comparing the Patrol Race to the accidents, it is critical to differentiate between overall conditions each day, avalanche problems and danger ratings, terrain exposure, and weather patterns. My assessment is from experience on race day, publicly available information, and my professional training. Avalanche Problems: Both avalanches are reported to have run on facets or on the new/old snow interface that was buried on 2/23 (not the 2/13 persistent slab problem in the forecast). Photos from Cottonwood Lake seem to show a tapering crown, which are often associated with a Wind Slab problem—this was the primary forecasted avalanche problem for Sunday. This wind slab was much more dangerous on Sunday than Saturday due to heavy snowfall Saturday night accompanied with snow-transporting wind speeds. Neither preliminary accident report mentions a step-down avalanche into the lurking Deep Persistent Slab (2/13 facets). It is also important to mention that there was an Avalanche Warning issued for Sunday, due to the increasing hazard, that was not given on Saturday. The avalanche danger was rated as “high” on Sunday which is says that “human-triggered avalanches are very likely” by the North American Public Avalanche Danger Scale. Terrain: The Patrol Race largely avoids avalanche terrain for its length. It does cross some small paths and a couple of larger paths (e.g. Silver, Tinkham). It never crosses through the start zone of larger paths. Overall exposure time is limited in this terrain, since the Silver paths are crossed on what is essentially a traverse (300m wide) and the Tinkham/Mirror path is a downhill ski leg along the lower margin of the path’s trim line. The accidents on February 25 both occurred in near treeline avalanche terrain with large, steep, open slopes that are more affected by wind and sun than the mostly below treeline, low-angle slopes of the race course. Weather: Telemetry at the Pass shows between 7-10” of storm snow accumulating Saturday night after the race ended. This rapid loading, accompanied by moderate (snow-transporting) winds, ratcheted up the hazard quickly in the evening and early morning hours of February 25. Wind slab (and storm slab) avalanche danger rapidly rose with these conditions. Low density snow caused by colder than normal temperatures likely contributed to greater redistribution of storm snow, allowing wind slabs to form more readily with lighter wind speeds. In summary, I feel like the race organizers did a good job evaluating avalanche hazard and weather conditions. The mountains are dynamic and our risk treatment must adapt to these changes. What is appropriate one day is often not appropriate the next. Limiting (or eliminating) exposure to avalanche terrain is always the primary way to reduce risk, especially when there are higher levels of uncertainty caused by strong storms and rapidly changing avalanche problems.